MattÃ¢â‚¬â„¢s note: Not exactly a WoW gaming related post. Feel free to mark as read and come back tomorrow. In fact, Matticus wonÃ¢â‚¬â„¢t be writing today since he has to get his other 2 wisdom teeth yanked and is in no condition to blog. TodayÃ¢â‚¬â„¢s post will come from Don Marco Matticus, one of MattÃ¢â‚¬â„¢s many relatives. Ah greetings. IÃ¢â‚¬â„¢ve pestered my dear cousin to write on his beloved blog for so long. I am, shall we say, delighted to be able to publish my intellect for others to consume. I am a far better writer than my dear cousin is after all. Before I start, we all need to make a fundamental assumption. Let us all assume I, Don Marco Matticus, is the reigning overlord of WoW Insider. I know it will never happen but just run with me on this one, okay? Let us also assume that you yourself are a creative gaming enthusiast with a passion for writing. In other words, you play video games and you like to write about video games. Heck, letÃ¢â‚¬â„¢s narrow the focus even more. 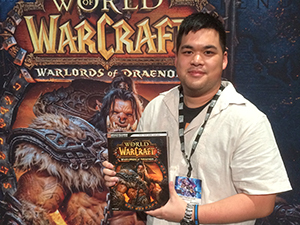 YouÃ¢â‚¬â„¢re a diehard WoW player and you want to write about it. And you want to get paid to write about it. DonÃ¢â‚¬â„¢t you? Because all of us are little peasants at heart. We can refer to that peasant as Matt Demon. Or alternatively you are a headstrong gaming enthusiast who thinks your opinion and written word is that of God. You think that what you say is always right and anyone who disagrees is pure blasphemy. Not only that, you think you can do a way better job than the staffers at WoW Insider and continue to wonder to yourself what these turkeys and clowns are doing writing all this stuff when you can do a far better job than they despite the fact that you have no experience of your own. I call those people snobs. Back in my day, people like that would get a good old fashioned kneecapping. If I thought they were real bozos IÃ¢â‚¬â„¢d cap their elbows so they wouldnÃ¢â‚¬â„¢t write again. Again, you might not feel this way but just please bear with me. Oh yes, Don Marco Matticus, Supreme Overlord and Editor in Chief (hypothetically). HereÃ¢â‚¬â„¢s a brief list on what matters, what doesnÃ¢â‚¬â„¢t, and how to boost your odds of getting in (if I were in charge). Getting in: There are two ways to go about it. You can apply or the Don can hunt you down himself and pitch you an offer. Understand that the Don has Troll headhunters at his disposal. If the Don wants you to write for him, he will make it known. If you apply via EMail, Fax, IM, or carrier pigeon, IÃ¢â‚¬â„¢ll consider it. If youÃ¢â‚¬â„¢re lucky and IÃ¢â‚¬â„¢m in a particularly generous mood, I might even reply. Formal education doesnÃ¢â‚¬â„¢t matter: Formal refers to things like degrees and doctorates. If you apply to me waving around the fact that you have a Ph.D, a Masters, and assorted BachelorÃ¢â‚¬â„¢s in Journalism, English, and Demonslaying IÃ¢â‚¬â„¢m not going to care a whole lot. The fact is that when it comes to blogging, anyone can do it if they commit. DonÃ¢â‚¬â„¢t get me wrong. Formal education can help. But it is not the be all/end all. You want to impress the brass? Start your own blog first! Prove that you can write creative and quality stuff often. The proof is in the pudding, as they say. DonÃ¢â‚¬â„¢t come to me with the degree saying you can write. Show me that you can write because I donÃ¢â‚¬â„¢t care about your piece of paper. Spelling and grammar still important: If you apply via e-mail and you make the DonÃ¢â‚¬â„¢s eyes bleed, then the Don will make the logical assumption that you will make the audienceÃ¢â‚¬â„¢s eyes bleed. Making the eyes of my reader bleed is bad for business. It scares away potential readers and ad clickers. Ad clicking is crucial to my survival. Without it, the Don will not survive. Please write clearly, check your grammar, and your spelling. Deadlines: Don Marco Matticus needs to have material out every hour on the hour. Columnists that write weekly have a set date to reach something by. However, if it is an epic piece that requires an extra day or two, that is fine. But it must be epic. There are certain pieces that need to come up every day at a particular time. Writing topics: You may not agree with or like what youÃ¢â‚¬â„¢re writing about. But the news (like spice) must flow! You may be tapped from time to time to report on major or breaking news and provide a brief opinion or translation of what it could mean. DoesnÃ¢â‚¬â„¢t matter if youÃ¢â‚¬â„¢re wrong or right. If youÃ¢â‚¬â„¢re wrong, the masses will tell you. If youÃ¢â‚¬â„¢re right, the masses will tell you that youÃ¢â‚¬â„¢re wrong anyway. Freedom of writing: Don Marco Matticus usually needs to approve what gets written for the masses to see. You think IÃ¢â‚¬â„¢ll just let people read any olÃ¢â‚¬â„¢ crap that comes out? The vaults of the Matticus family may be large, true. But they are not limitless. You will be compensated fairly for the work you do. No one cares about you killing Mag for the 20th time. ThatÃ¢â‚¬â„¢s why an element of creativity is a key asset to those that wish to join the Don. There are no limits to the amount of stories you can write. There is no cap as long as you donÃ¢â‚¬â„¢t write crap. Have really thick skin: Are you one of those players that cry every time your raid leader picks on you? Then forget it! I do not take those of weak minds under my fold! You will be insulted, your words torn apart, your name mocked on a daily basis. I received E-Mails on a daily basis calling for your head! Of course, I am far more wiser than anyone gives me credit (especially that Matticus). You will be critically criticized so hard every proc on the planet will occur. It will test the very foundations of your character. Can you endure it? Be aware that every fact you list will be checked. Every opinion you write, analyzed. Every breath you take, scrutinized. The ability to handle criticism and not lash out at the masses (however uneducated they may be) is extremely important. Payment: You will get paid in sacks of rice, beans, or gold. It all depends on my mood. I will pay 2000 gold coins for a thousand words and half of that for half the amount! If you do an image gallery for me, then a sack of beans per image will be sent to your home. Should you write more than I ask, the Don appreciates your hard work. But you shall still only get 2000 gold per post. Is it enough for you to quit your day job? It depends on how much of a lavish life you decide to live. The possibility is there. Retroactive editing: So you made a mistake. The Don is very forgiving. Sometimes those crazy Blizzard fools will make you look bad by making a change that has ruined your post and made you look like a complete moron. As a result, the masses have decided to rain on your parade. You can always edit them after the fact. And we donÃ¢â‚¬â„¢t use this WordPress garbage that my cousin so heavily relies on to power the blog. Do not insult my minions: That honor belongs to me. You spit on my peasants and I will send my Corehounds after you. Only I can criticize my workers. If you apply and even mention any of my staffers in a negative light, your message will be shredded immediately. The family is everything. You insult one, you insult all. Did they even teach you social skills? Keep all of these in mind should you decide to apply for any major WoW publishing service. They all have standards. Not any mindless, bumbling fool can get in. Even though it may appear that way, these minions do know what theyÃ¢â‚¬â„¢re talking about and get paid for a reason. You are not. The only way for you to oust my companions is for me to fire them or for them to step down. Your opinion and word mean absolutely nothing to the Don. Matt and I want to thank you for the overwhelming response we have received so far to our call for submissions – they have impressed us in terms of quantity as well as quality. We really shouldn’t have been surprised, considering the existing quality and participation we see from the community around this blog every day, but we were a little caught off guard by the enthusiasm! We have decided to leave the casting-call open for a week. All submissions must be entered by midnight, Pacific Daylight Time on August 20th. The prize is a spot on the World of Matticus staff – an unpaid, glamorous job characterized by fraternization with the coolest bloggers in Azeroth, Outland, and Northrend. Thanks in advance, and we look forward to hearing from you!